Although the Mr Green brand has existed since 2007, the sportsbook was only launched in 2016, so it is quite fresh on the market. The parent company of the online sports betting provider comes from Sweden and is now based in Malta, where it is licensed. UK customers can rest assured because Mr Green is also regulated by the UK Gambling Commission. This Mr Green review will see whether the quality of the online casino has been passed on to the sportsbook by taking a closer look at various aspects such as the sports selection, the payment methods, the respectability of the bookmaker as well as any Mr Green bonus offers. Boost your winnings now! Play boosted Accas on selected matches at Mr Green! Place a 25 GBP bet on accumulators of at least 3 legs on any sport and get a 5 GBP free bet. Secure your profits or minimize the losses with the Cash Out Feature even before the event is over! Mr Green & Co AB is listed on the Stockholm Stock Exchange and licensed both in Malta and the UK. The online betting provider started with a casino, which was founded in 2007 by three Swedish entrepreneurs called Fredrik Sidfalk, Henrik Berqquist and Miakel Pawlo, and launched it in 2008. Our Mr Green review discovered that it was one of the first to offer games from several suppliers back then. Today, Mr Green has a gaming portfolio of more than 700 games. In 2016, they expanded their offer by adding an online sportsbook. Over the years, Mr Green’s outstanding work has been recognised by the EGaming Review (EGR), the International Gaming Awards (IGA) and TOPP 100 many times. For instance, Mr Green was awarded the IGA 2017 Gaming Operator of the Year. New customers at Mr Green can obtain a 10 GBP free bet when they sign up. In order to activate this bonus offer, your initial deposit must amount to 20 GBP or more. You must take into consideration that deposits made via Skrill, Neteller and Paysafecard are not eligible for this bonus offer. The next step is to place a bet of at least 20 GBP on any sports market at odds of 4/5 (1.80) or higher. This can be one single bet or a number of bets totalling 20 GBP. Once your qualifying bet has been settled, Mr Green will reward you with one free bet of 10 GBP. According to our Mr Green review, this free bet is valid for 7 days. It is also important to mention that only the winnings made from the free bet will be returned and not the stakes themselves. 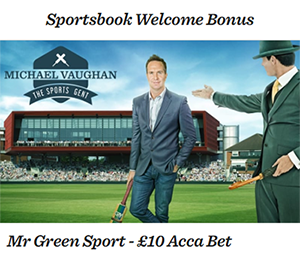 There is no Mr Green promo code for this offer, you just have to opt in when you register with the bookmaker. There are a few things you should consider when trying to claim your bonus. Most of these details have been covered in the instructions below, drawn up by our Mr Green review. Step 1 – Registration: Click on the yellow “Create Account” button in the top right corner of the homepage. Set up your account by entering a password and e-mail address. This is followed by an account verification and then you must enter your personal details. Don’t forget to opt-in to this bonus offer. Step 2 – Making a deposit: In the Cashier section, click on “Deposit” and select a payment option. N.B. Skrill, Neteller and Paysafecard are excluded from this offer. Make your first deposit amounting to a minimum of £20. Step 3 – Fulfil the bonus conditions: Place one or several bets totalling at least £20 at odds of 4/5 (1.80) on any sports markets. Step 4 – Use the free bet: Once your qualifying bet has been settled, Mr Green will credit a £10 free bet to your account. You have 7 days to use it. Only the winnings of this free bet can be withdrawn, not the stakes. 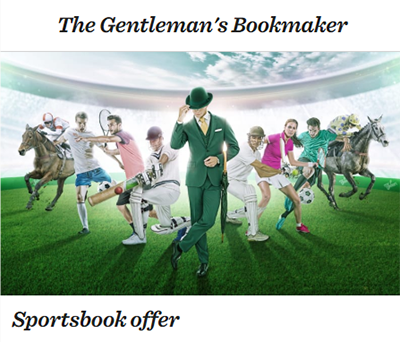 During our Mr Green review, we were pleased to see that the bookmaker also has some special offers for existing customers, even though there are not that many of them. One Mr Green offer is called “Daily Racing Specials”. Every day, Mr Green has different offers for a variety of racing markets: Jockey Specials, Winning Distances, Enhanced Place Terms, Price Boosts and Enhanced Multiples. These special offers usually apply to all UK and Irish racing. Just like many other bookmakers, Mr Green also offers “Best Odds Guaranteed” on UK and Irish racing. This means that if you bet on a horse at odds of 4/1 but the odds change and the race ends up starting at 6/1, so a higher Starting Price (SP), then Mr Green will pay you out at the bigger odds if your horse ends up winning. The sports selection at Mr Green is balanced and broad: Around 35 different sports. It seems that the bookmaker has spent quite some time studying the market in order to offer exactly what punters want. Among others, you will find football, tennis, basketball and ice-hockey. Even some fringe sports such as bandy, cyclo-cross and trotting are represented here. In addition, there is a range of virtual sports at Mr Green, such as League of Legends and Dota, as well as some novelty bets on politics and entertainment. Our Mr Green review was also satisfied by the depth of the portfolio. Of course, football is the main focus here with around 100 betting markets per match in the top leagues. The variety might drop when you go to the lower leagues, but there is still enough to choose from. Other bookmakers might have more depth, but you must keep in mind that Mr Green has only been in the sports betting domain since 2016. In terms of live-betting, Mr Green also has some catching up to do. The betting offer here includes the most popular sports such as football, basketball, ice hockey, handball, etc. For most football matches, punters can bet in real time. The selection is not as broad when it comes to other sports. Unfortunately, Mr Green has not set up any live streaming functions yet, nor a live score. Hopefully, this will be expanded in the future. Since Mr Green was launched in 2016, long-term observations regarding odds cannot be made. However, they seem to be attractive and the average lies at around 93%. This might not be an outstanding number, but it is still quite respectable and stable. The best odds, according to our Mr Green review, can be found for bets on tennis. These sometimes rise to 94%, whereas for football they are generally at 92%. However, the odds do not usually go any lower than 90%. The odds mentioned refer to pre-match bets, live-bets tend to be a little bit lower. The sportsbook offer of Mr Green is quite recent, therefore it is normal that not everything should be perfect according to our Mr Green review. Still, the sports selection is quite varied with around 35 sports and even includes some virtual sports. The depth of the betting range could be better, but the offer is consistent. Unfortunately, the bookmaker does not offer any live-streaming yet, a feature which is much appreciated by punters in general. The customer service though is excellent and available 24/7. The Mr Green welcome bonus offer in the form of a 10 GBP free bet might not be the most generous one on the market, but it can be easily obtained. Overall, Mr Green makes a good impression and will certainly improve as time goes by. The methods of payment offered at Mr Green are quite solid and varied. Among others, you will find that they include the main credit cards, such as VISA and MasterCard, some e-wallets (Skrill, Neteller), prepaid cards such as Paysafecard and of course the traditional bank transfer. This might not be the largest selection, but you will surely find an option that suits you. Mr Green does not charge a fee for deposits and the minimum amounts range from 5 to 10 GBP. In most cases, your funds are available instantly. Step 1 – Go to the banking section of your account: Log into your account and go to the Cashier. Step 2 – Select the desired payment method: Choose the payment option that suits you best, enter the amount and select the currency. Step 3 – Transact: Fill in any other necessary details required by the financial institution. Confirm your deposit and your deposit should be processed immediately for most options. When it comes to withdrawals, you can withdraw once a week without being charged anything. After that, you will usually be charged 1% on any withdrawals amounting to more than 100 GBP. Our Mr Green review strongly suggests using the same method for withdrawals as for deposits, if you wish to avoid longer processing time. As a rule, withdrawals are processed in 1 to 3 days for e-wallets, but it can take up to 5 days for credits cards. The minimum amount that can be withdrawn is 30 GBP. The customer service at Mr Green can be easily accessed by clicking on the question mark (?) at the top right corner. There are various ways to reach the support team. The live chat function is available 24/7 and the staff is very competent. You can also call the free telephone hotline by dialling +442035100870. Another option is to send an e-mail to customerservice@mrgreen.com or simply complete the contact form in the “Support” section. In addition, our Mr Green review noticed that there are 76 answers to the FAQs. 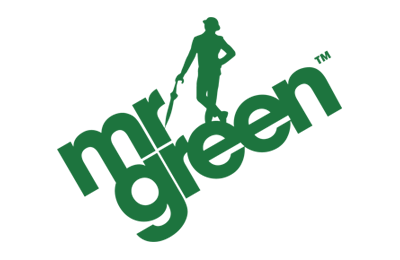 Mr Green is available in many languages, including English, German, Swedish, Norwegian and Finnish. Our Mr Green review noticed that the bookmaker is present on various social media platforms, yet it does not seem to be a priority. On Twitter, you can follow the sportsbook @MrGreenSport. There are a little more than 1,200 followers and daily tweets, but competitors are much more active in this area. With over 5,000 followers on Facebook, this platform seems to be more popular. However, there has not been much activity here for some time. Social media is usually used to promote current offers and post some sports news. Reliable or scam: How safe is Mr Green? No punter wishes to bet at a bookmaker that does not take care of safety. Our Mr Green review can assure you though that this is not the case of this particular sportsbook. First of all, Mr Green is licensed in Malta as well as the UK by the local gambling authorities. Even though the sportsbook was only launched in 2016, it belongs to a group that has been in the online gaming business for about a decade. This speaks in favour of Mr Green. The online betting provider is seriously committed to protecting customers and helping those with gambling problems. Under-aged teenagers do not have access to Mr Green. What is more, the bookmaker has developed its own concept of Responsible Gambling called Green Gaming and implemented measures and tools to help punters. How do I place a bet Mr Green? First, select a market that you would like to bet on by browsing the sportsbook. Your bet slip (and odds) will appear on the lower right side of the screen. Then enter your “stake”. The bet slip will automatically calculate your potential winnings. Finalise the bet by clicking on “Place Bet” at the bottom of the slip. What is the Cash Out feature at Mr Green? The “Cash Out” feature is the latest trend in sports betting and can now be found at most bookmakers. This tool allows you to secure your profits and minimise your losses by “cashing out” while the match is still going on. Is there a Mr Green App? Yes, there is. First of all, the Mr Green mobile website works well on your smartphone browser. 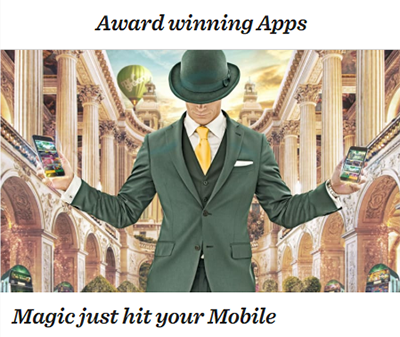 In addition, there is a Mr Green app for both Apple and Android devices so you will never miss a bet or a Mr Green promotion. Why does Mr Green need to verify my identity? This is done in order to comply with the gaming licences. You need to provide some form of identification to Mr Green when you make your first withdrawal, at the latest. This is to ensure that the bookmaker is transparent and fair, as well as to prevent under-aged teenagers from using this service. Can I set deposit limits on my account at Mr Green? Yes, you can. According to our Mr Green review, the bookmaker takes this very seriously. You can set limits on your deposits and wagers, as well as session limits. Furthermore, there are tools available so you can lock your account for some time.